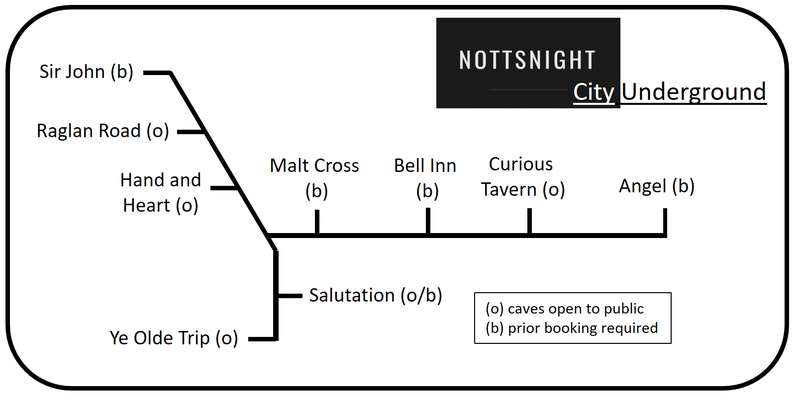 Unlike our other NottsNight Trails, the Underground isn’t a pub crawl in the traditional sense. But it is a fantastic collection of venues which open up a fascinating slice of Nottingham’s history. Built on sandstone, the city’s foundations were carved out over the centuries for a variety of uses. Today, you can explore it by either simply turning up to one of these pubs, or by booking ahead. As indicated, you may need to book – or ask nicely – to access some of these caves. Not all are always open. We’re grateful to Nottingham City Archaeologist Scott Lomax for helping with our research. Starting at Canning Circus and the Sir John Borlase Warren offers a large, sprawling open bar featuring up to twelve ales on tap, craft beers and – apparently – Nottingham’s biggest selection of gin. You’ll need to book ahead to view the caves which are in the cellar. The Raglan Road – actually on Derby Road – was carved out of a former lighting shop in the mid-2000s – and boasts live music and live sport. Yes, it can get a bit too lively for some – with an infamous urinal featuring a full image of Donald Trump’s head. The caves here are a bit small – at the back of the bar – but open to the public. And a good cosy bolt hole away from the main melee. Next door you’ll find the Hand and Heart – which is arguably one of the best and most extensive uses of Nottingham’s cave system. The main bar disappears into a long, lower floor housing the pub’s acclaimed dining area. If you just fancy a drink, there’s cosy seating nestling into the sandstone walls – with an upper area that also doubles up as a performance area for live music. You might expect Maid Marian Way to feature something medieval – and The Salutation Inn provides just that. Traditionally a”rocker’s” pub, the new management in 2017 have promised to bring back the Sal’s former glory. The thick walls and flagstones point to the building’s age. Cave access is generally via organised tours – but if it’s not too busy and you ask nicely, the landlord may let you in. Over on Castle Hill and one of three pubs claiming to be Nottingham’s oldest. You’ll be immediately in the heart of the caves when you walk through the front door of Ye Olde Trip to Jerusalem and quite possibly entertained by a game inviting you to get your ring on the horn. On St James’ Street The Malt Cross is one of the longest surviving Victorian music halls in Britain. A couple of years ago it was awarded a major pot of lottery funding which has been used to open up access to the caves. In a former life they were used by monks to brew ale – and in more recent times you could have enjoyed a curry here. Generally the caves are only open during organised tours – but do look out for open days and special events too. Just off Old Market Square is The Bell Inn – a large, long hostelry with the oldest parts in the front two bars. Look out for the barrels offering views downwards into the caves – or join a tour to see them in detail. The Curious Tavern and Lost Caves – on George Street – was newly opened in 2017 in an effort to show off some of the more unusual features of the Mecure Hotel. You’ll have to seek out the caves from a separate entrance off Carlton Street and may face a wait to be seated. The caves are often only open on Thursday, Friday and Saturday evenings. Not far away, in the Hockley area – is The Angel Microbrewery. Once the heart of Nottingham’s alternative scene, the bar has relaunched with a fresh look and no sticky carpets. Cave access is by prior arrangement – often as part of an organised tour. The Original Nottingham Ghost Walk providing access to The Salutation. The Malt Cross offers guided tours on most Saturdays and Wednesdays, and prior booking for groups. Madame Parboiled Pub Tour taking in the Bell, the Salutation and the Trip to Jerusalem. Madame Parboiled can also be occasionally found at the Sir John Borlase Warren. Ezekial Bone Lace Market Tour offers occasional access to the Angel Microbrewery. 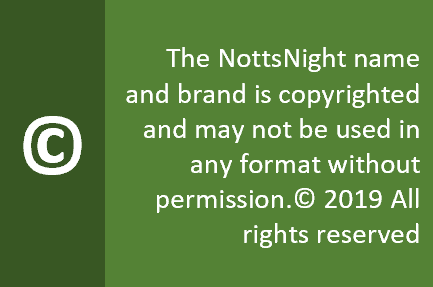 Next Post NottsNight goes underground!